I have found out that Beth Moore is going to have one of her Living Proof conferences in the area on May 31 and June 1st. I just put a cry out on facebook to see if anyone would be interested in tagging along to this with me. I'm gonna go either way though! I need some conferences in my life this year to keep me spiritually focused - cause I go out of focus so frequently. 2. I ran two 5Ks last week during our winter break. They weren't official races; I just went to the local park. The weather was nice enough, and it felt good to run outside. I will be running a race (5K) at the end of this month. It will be my first for the year - the kick off of my race season. I can't wait! Today, we went and had hibachi. It was GREAT. 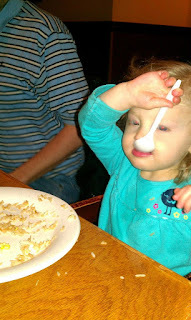 Beth loves trying to eat with chopsticks, and Hannah ate EVERYTHING she was served. I especially love it when they throw the eggs up into their hats or make the fire onion. Hannah freaked out over the fire just a bit, but then, she loved it too! Today's forget-me-not: Spoil yourselves every once and awhile! 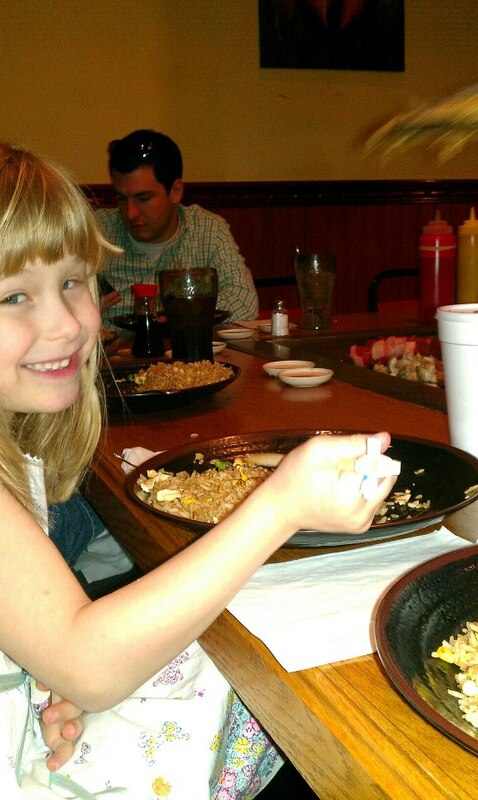 Go eat hibachi!